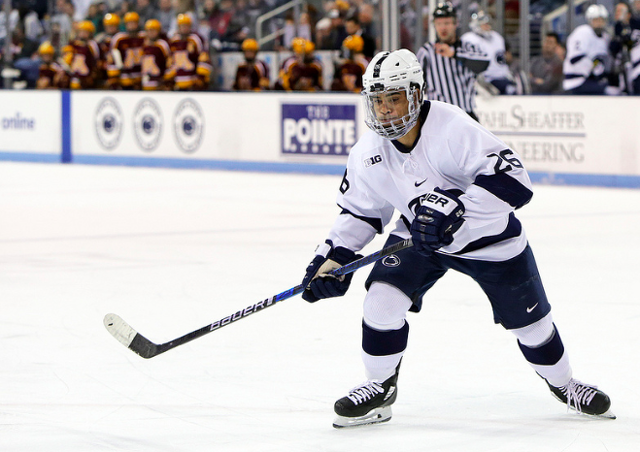 Penn State hockey will leave South Bend with a feeling that has permeated much of the season. In fairness, the Nittany Lions finish at 22-16-2 which in terms of wins, is second-best ever in the program's brief but growing history. Even so, missed opportunities over the past several months have turned out to be the difference between the bubble and an at-large bid. Blown leads and losses to otherwise less successful teams are sprinkled throughout the year, speed bumps along an unforgiving road. There is something to be said for the difficulty that comes with playing in the Big Ten and there is something to be said for the difficulty of winning and winning on the road. Nevertheless, as the year churned along it felt like a season this team would end up regretting, not for its lack of overall success, but for the success that was nearly had. In nearly every measurable facet, this particular iteration of Penn State hockey is the deepest it has ever been. Against a sample size of only a few comparable seasons this is not to say the Nittany Lions were a Frozen Four team in the making, but given past achievements, it seemed fair to hold the team to a similar barometer. And yet those moments of 'almost' piled up. Peyton Jones was good but not great much of the year, and Penn State's defense was exactly what it looked to be. A group full of skilled offensive players but unproven in its own zone. For all the goals the Nittany Lions scored, they were not short on charity at the other end of the rink. So as they left the ice on Saturday night having fallen 3-2 to Notre Dame in the Big Ten Tournament Final, it was easy to imagine the feeling of 'what if?' circling through their heads yet again. Because in many ways Penn State was the better team. Despite giving up the first goal of the game and entering the first intermission tied at 2-2, the run of play favored the Nittany Lions. The Irish have spent the season leaning on their defense and goaltender Cale Morris and were largely content to do the same one last time getting outshot nearly 2-to-1. The defensive plan worked like it had all season long for Notre Dame. Jones was sharp, but not quite sharp enough as the Irish pounced on their opportunities. The first and third goals in particular seemed avoidable, but nevertheless, the Nittany Lions still trailed by just a tally in the third period, struggling to crack Notre Dame's defense. As the final score indicates, the tying goal wasn't to be. Two power-plays were effective in terms of possession earlier in the game, but neither found the back of the net. A late scramble never amounted to as much as the flailing bodies might have indicated and despite pulling Jones in the final minutes, it was only the allusion of opportunity, rather than actual chances, that survived the waning moments of regulation. It is hard to say that Penn State will skate into the offseason feeling as though the year was a failure, but with an Allentown regional just two goals away, and a roster not short on skill, one would be hard pressed to claim this season was as much of a success as it could have been. For now the program it will find itself in a new place and uncharted territory. It will feel like it came up short, and for the first time ever it will feel like it didn't match or exceed the previous season's accomplishments. This day was always going to come, and in many ways it is surprising that it hasn't happened yet. But it has arrived now, and the emotions that come with it will follow suit. In the bigger picture Penn State would be wise to focus on what it isn't, rather than what it wasn't. Since making its first NCAA Tournament two years ago, the Nittany Lions have been nationally relevant, they have continued to sell out games and bring in better and better recruits. Across the country those attributes are not a guarantee, nor should they be taken lightly. It isn’t a program gasping for air. That's not to say that Saturday night's result, and aspects of the season at-large, will not bring fans, players and coaches the feelings of disappointed mentioned above. But in the grand scheme of haves and have-nots, the Nittany Lions find themselves in the right quadrant of the conversation, and with no indication that they will be leaving that conversation any time soon. And there is something to be said for that. 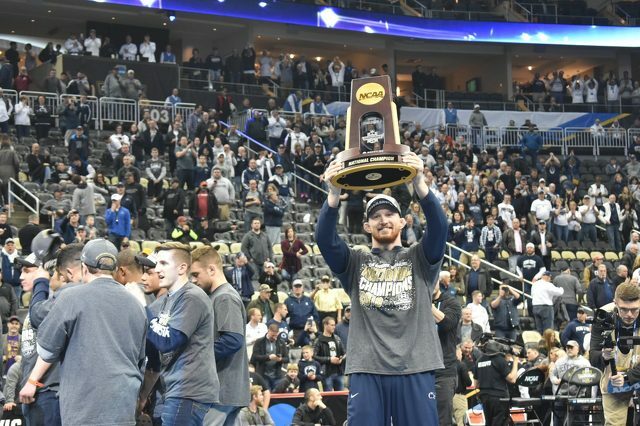 PITTSBURGH — Penn State wrestling entered the finals of the NCAA Championships on Saturday night with the national title locked up and seeking additional points for its gaudy team total. With five Nittany Lions wrestling in the finals, Penn State crowned three national champions and said goodbye to two of the most decorated athletes in school history.